Crime fiction is one of my favorite genres. Dame Agatha Christie is my joint favorite author in the genre, along with another legend, Sir Arthur Conan Doyle. When I decided to write about the books I love for #AtoZChallenge 2019, the first book that came to mind for the letter A was this one. To be frank, it came as no surprise to me. And I’m sure to those who know my favorite reads, this choice would be no surprise either. It is my belief that a good crime fiction is based around three or four key aspects: the detective, the motive, the victim and the pace of the book. In this novel, there is no detective per se. This is a locked room mystery no doubt. The murderer and the victim(s) are in the same room. As a reader, you know who might be killed, but the curiosity to know who actually is killed is what keeps the pages turning. With multiple victims chosen for some “crime” of theirs, it makes me wonder who might have a grudge against all victims. The book keeps the reader engaged from first to last, without giving any hint of who the killer is. And that is top notch writing from the Queen of Crime. What makes this book even more interesting is that it is based around a poem. 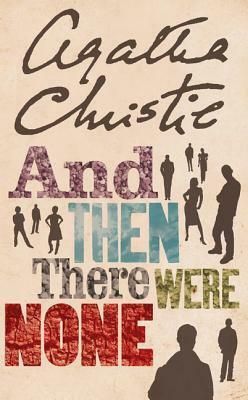 This might be one of the top two novels written by Agatha Christie. I’m a big fan of the author, so this might be a tad biased. But if someone were to ask me for a recommendation among the author’s works, this would be the one I would suggest! Cheers, T! 🙂 I hope you do take home some good recos. I started to read Christie again recently and I’ve really enjoyed her, better than i rememebred. I think Christie books, and this one in particular, are worth reading again. Do reread if you can, JazzFeathers! I’m fond of Agatha Christie, but this is one I haven’t read yet. I am currently listening to the audiobook of Murder On The Orient Express read by David Suchet. I’ve read the book many times, I just enjoy hearing the voice of an actor interpreting a book I’ve enjoyed. Looking forward to your future posts on this theme. A good idea! Mine is on SF and fantasy. I’ve posted now. You know, I live watching crime on the telly but interestingly I haven’t read a lot. Agatha Christie was a big favourite of my ex-mother-in-law too and still I only read one book of hers. I’ve now added this to TBR list as the next one! Thanks! I hope you enjoy the read. While I do enjoy watching crime on the telly, I spend more time reading it, so have read a lot of Agatha Christie books already! 😉 Thank you, Andrea. And I wonder, when will I get to read this ! Hey, it’s nice to meet a fellow book blogger. I am in the April AtoZ 2019 Challenge as well. I can’t say I’ve read any Agatha Christie’s books but I do like crime fiction once in a while. Cormoran Strike in J.K Rowling’s book series and Jo Nesbo novels are up my alley. Have fun and good luck! I suppose it depends on the genre, Jackie 🙂 I hope you try this and enjoy the read. I’m not doing a theme this year btw. I have a fixed meme/tag for each day of the week. Like today is #mindfulmonday. So going ahead with this same schedule. I’m a booky person – yet I haven’t read this one yet. You have sold it to me, great start to the challenge! I’ll be back. I hope you enjoy your read, A.J. Sefton! 🙂 Welcome back any time. This is a book that even I’d suggest anyone who would ask me for crime fiction suggestion. This is one of my favourites too! I was mindblown when I read this. Love your theme. Glad that you love the book too, Reema! 🙂 Yes, definitely worth the reco, I feel! A perfect author and book to set us on our way! I can’t get enough of Agatha Christie, preferably in written form rather than on the large or small screen. Great to catch up with you again on our annual pilgrimage! I’ve not watched an Agatha Christie movie, Keith. Maybe I should. 🙂 I prefer the written form too. Unable to go wrong with this Agatha Christie mystery. Great example of good writing. Looking forward to you list of choices in April. I agree with you. 🙂 Thanks, Gail. I love love Agatha Christie!! My favourite are her Poirot Series!! Mine too, The Dream Girl. I love books, so I’ll enjoy following this A-to-Z. One of my favourite books from my favourite author. I always recommend this one to people who are unfamiliar with her work. Going to check out your other posts, to see if we have more in common! Feel free to drop by through the rest of the challenge. Glad to meet a fellow Christie fan and thanks for liking my post.